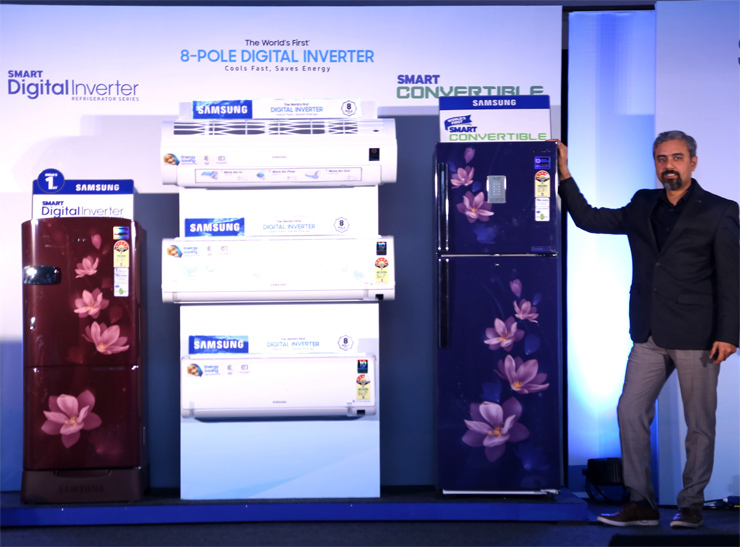 Samsung has introduced a new refrigerator and air conditioner range suitable for Indian homes. It’s refrigerator – Direct Cool and Smart Convertible are interesting because they are equipped with digital inverter compressor that allows the refrigerator to work with solar power, allowing the user to refrigerate food with a clean source of energy and even home inverter, in case of a power cut with a cooling retention of up to 9 hours. Moreover, the refrigerator can withstand voltage fluctuation ranging from 100 volts to 300 volts, helping to prolong the life of the refrigerator by over ten years. The S-Inverter AC range consumes less power compared to the competition and boasts a corrosion resistant material for its outdoor unit and voltage protector feature. Smart Convertible Refrigerator is priced at Rs. 27,250 with sizes going up to 670L. Smart Digital Inverter Direct Cool Refrigerator starts from Rs. 14,900 for 192L to 230L. S-Inverter, Digital Inverter Technology based Air Conditioners are priced between Rs. 35,900 to Rs. 66,600.